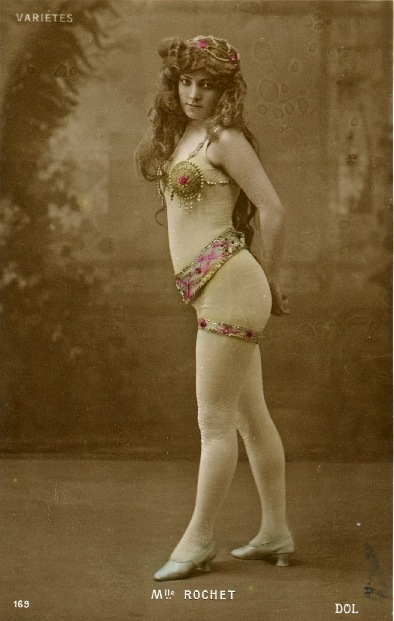 This is another collage I made from a 1908 postcard I found of Mlle Rochet, a young dancer and performer. In this card, someone has tinted her shoes a brighter blue than in postcard #1, and they’ve given her a candy-pink body stocking. I love the thoughtful, unsmiling expression on her face, and I love that she seems to be fiddling around with the strap of her costume. In this collage I was exploring my notion of and feeling for the fictional Victorine Meurent I wanted to create as a character, but I was also trying to send myself some kind of gentle message about work habits and creativity. That’s why I included the Muses love the morning phrase. I’m not the sort of person who uses a word like “muse” very easily—it’s more natural for me to talk about hard work—but in this collage, I felt able to call upon that old word and all its power. Because while I feel uneasy around words like “muse” and “inspiration,” I do feel comfortable talking about being in love with characters. And by the time I made this collage, I was already in love with Victorine Meurent and the idea of writing a book with her as a narrator. And I stand by my statement: muses do love the morning. That’s when I find it easiest to work. I also think mornings are the best time for going for a walk or for sleeping deeply, though, and I often fight battles with myself over what I most need to do with the hours from 5 to 8 a.m. And the truth is, I didn’t just work on Paris Red in the morning. Sometimes I took notes in bed before I slept, almost as my eyes were closing. For me that’s another intimate time to write, especially if I’m trying to get at some risky, emotional truth for a character, or see her vulnerability. Just as I did in the first collage, I put bits of nature next to Mlle Rochet. 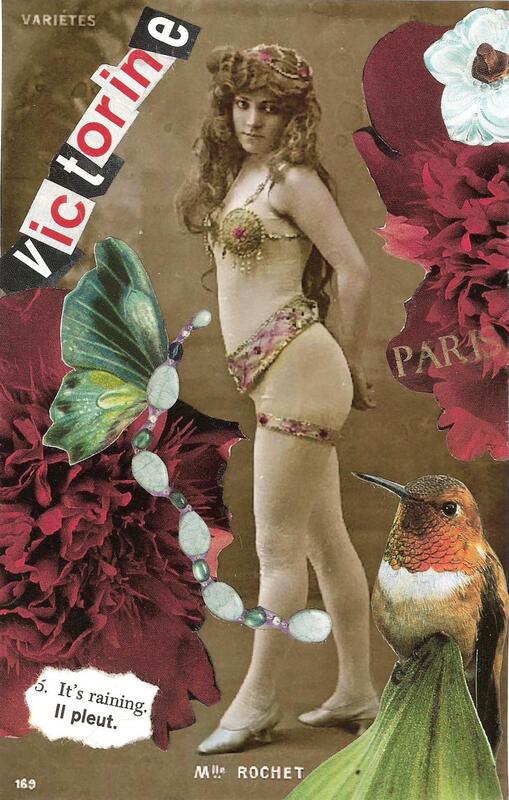 She might have been standing in a studio somewhere in Paris, wearing a provocative stage outfit, but I felt her spirit came directly from nature, just as I believed Victorine’s did. The raspberry-dipped house finch was an easy pick because of the color, but so was the moist, spotted frog—not everything can be pink! At the time I thought I wanted to surround her with peonies just because I love them so much, but I hadn’t yet thought about how often Manet painted peonies.